Hot off the production line, the new TRX700XX exhaust is offered in a slip on or full system (click here for full system). 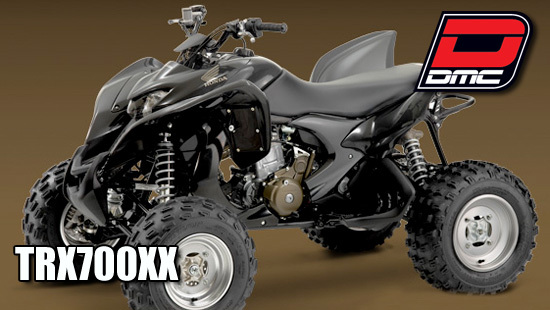 Developed and manufactured to take your Honda off the map, your TRX700XX just a HUGE leap on the competition. This Slip On loads you up with a 14.8% horsepower increase and 15.1% torque increase with just under 4 pounds of weight savings compared to stock! As a competition Slip On, this bad boy gets you moving, but holds its throat at 102db. So, if you have some place you wanna go, this DMC Slip On is the answer! Full production photos pending, but this Slip On IS in stock and shipping now! It's specifically mapped to work in conjunction with your DMC Exhaust to deliver every ounce of torque and horsepower in a smooth and responsive power curve. It's fully adjustable with three simple buttons on the faceplate to adjust the fuel curve richer or leaner in each area of the map. Advanced engineering eliminates the need for complicated computer programs or interfaces. Everything is controlled directly on the EFI Control Module.